How to make Chettinad Keerai Mandi Recipe. karaikudi special. Spinach Curry Tamilnadu style. A very traditional easy to do dish. With step by step pictures. The Chettinad women folks are said to be very thrift and use even the inexpensive ingredients wisely. The usage of mandi (rice water while washing rice) is a gem. They are said to never waste anything however inexpensive they may be. Not just in cooking. Life in general. The olden day Chettiar community was a very affluent community and traded all over the world. 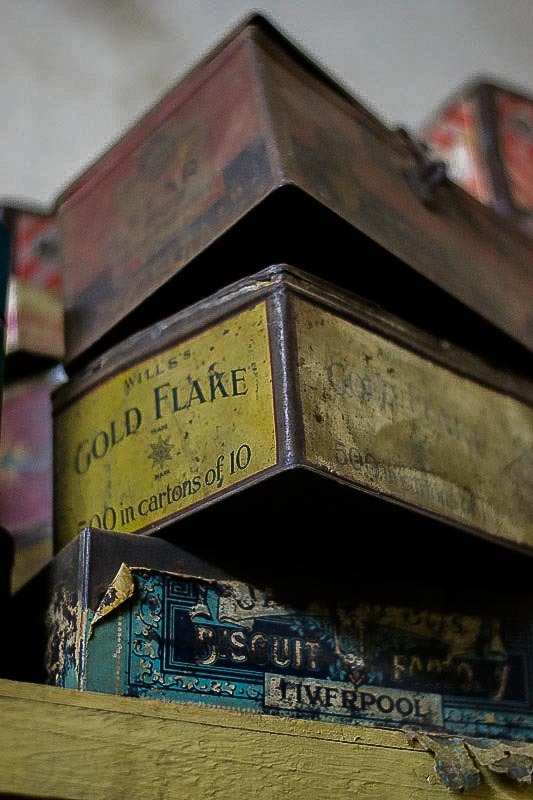 This is a picture of an old Cigarette box and a biscuit box from the 1950’s that I found on the attic in Karaikudi on my recent trip. They have put even these simple things to use in their everyday life for decades. These are not to be confused with hoarding. 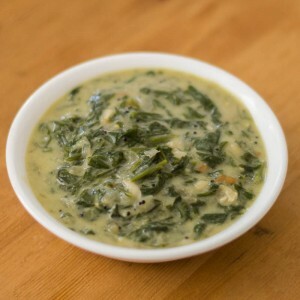 This recipe is an everyday spinach curry – Keerai Mandi served with rice during lunch. 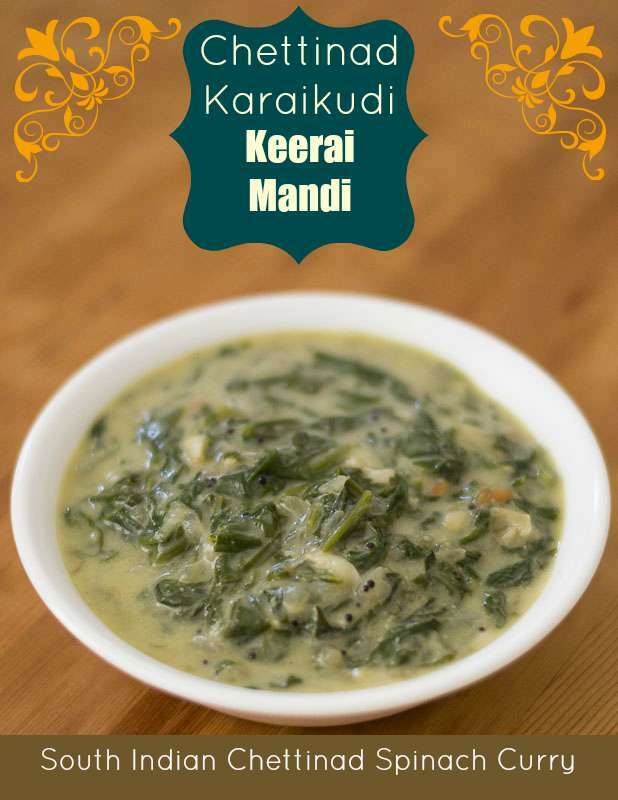 Keerai Mandi is a mainstay in Chettinad cuisine of Tamilnadu. Its called as Keerai (Spinach) Mandi for a reason. So what is Mandi? Mandi in tamil means sediment. In cooking, mandi refers to arisi mandi or rice mandi. Its nothing but the left over water from washing rice. When we cook rice for lunch, just soak the rice in water for 5 minutes. After 5 minutes mix (rub) the rice and water well with your hands and drain. The starchy drained water is mandi. So what is the short cut for making mandi? 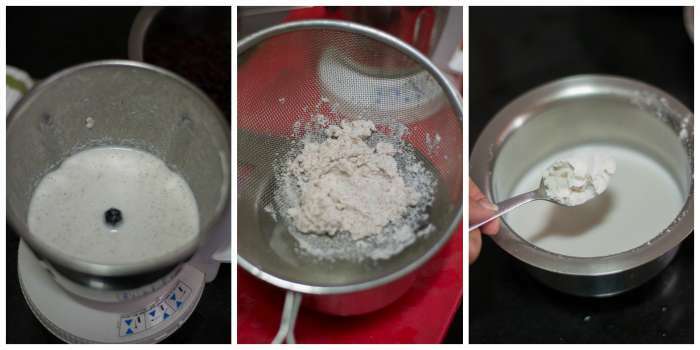 If you are in a hurry, just mix 2 teaspoon of rice flour in 1 cup of water and mix well. Thats instant mandi for you. We will need about 1 cup of mandi for this recipe. Here is the recipe for Keerai Mandi. 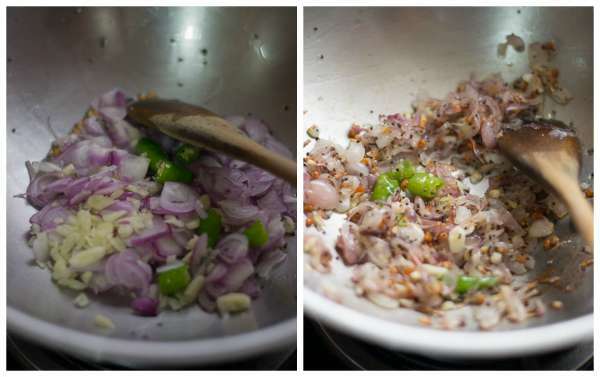 Chop the shallots (small onions), garlic and green chillies. Set aside. 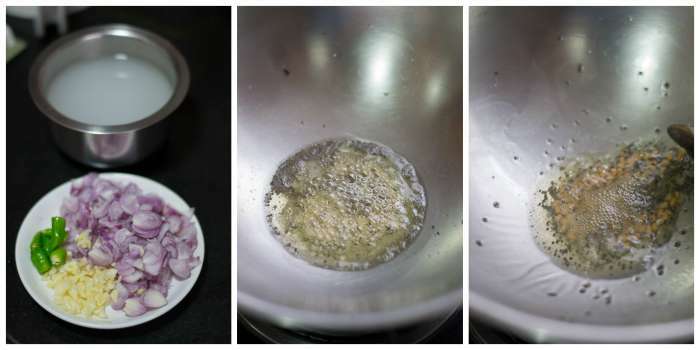 Heat oil in a pan and when the oil is hot, add in the mustard seeds and the urad dal. Wait for the mustard seeds to splutter and the urad dal to brown. Tempering is key for the taste of the final dish. So have patience until the mustard seeds splutter and the urad dal browns. Add in the green chillies, garlic and the shallots (small onions). Fry till the onions are soft. 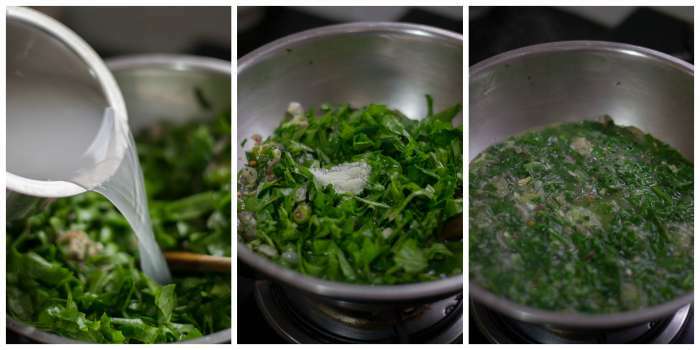 When the shallots are frying, clean, wash and roughly chop the spinach. 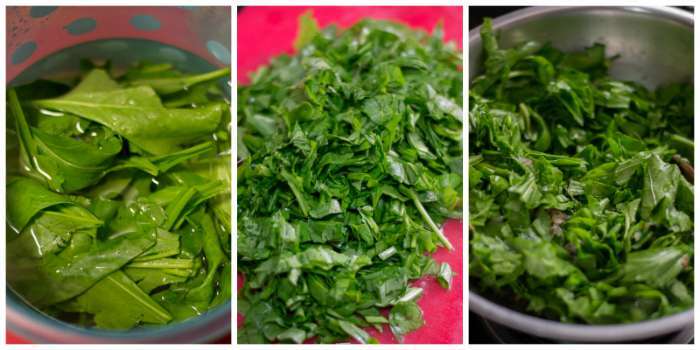 You can use any kind of spinach leaves for this recipe. Add in the spinach to the pan. Add in the rice mandi and the salt. Let the mixture boil in medium flame for 10 minutes. When the mixture is simmering, lets grind some coconut paste. Grind 1/3 cup of coconuts with one cup of water to a very smooth paste. Strain on a sieve. 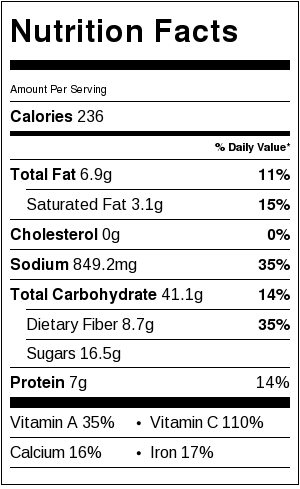 We got coconut milk and to this, add a heaping teaspoon of rice flour. Mix well to combine. 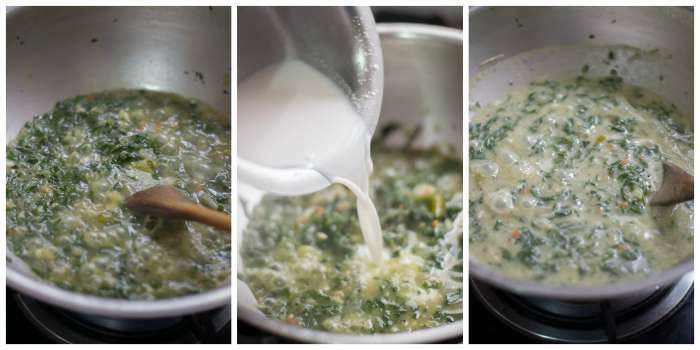 When the spinach mixture is thick and saucy , Add in the coconut milk mixture to the pan. Simmer for a minute. Switch off the flame and remove off heat. Serve hot with rice. Heat oil in a pan and when the oil is hot, add in the mustard seeds and the urad dal. Wait for the seeds to splutter and the urad dal to brown. When the shallots are frying, clean, wash and roughly chop the spinach. Add in the spinach, rice mandi, and the salt. Let the mixture boil in medium flame for 10 minutes. Grind ⅓ cup of coconuts with one cup of water to a very smooth paste. Strain on a sieve. This is coconut milk and to this, add a heaping teaspoon of rice flour. Mix well to combine. What is Mandi? Mandi in tamil means sediment. In cooking, mandi refers to arisi mandi or rice mandi. Its nothing but the left over water from washing rice. When we cook rice for lunch, just soak the rice in water for 5 minutes. After 5 minutes mix (rub) the rice and water well with your hands and drain. The starchy drained water is mandi. So what is the short cut for making mandi? If you are in a hurry, just mix 2 teaspoon of rice flour in 1 cup of water and mix well. Thats instant mandi for you. We will need about 1 cup of mandi for this recipe. Keerai Mandi tasted super good. Everyone loved it. Thanks for the recipe Suguna. The keerai mandi recipe came out awesome. Its subtle and a healthy dish. Thanks for sharing the recipe. Its one of my everyday favorites! I liked ur keerai mandi..a different taste..it came out good..good job kannamma..
Hope you are well. I would love to try this and just wondering what sort of green leaf would be suitable for this dish? I can only get baby spinach (Palak) here. My mam used to make something similar to yours with Bok Choy. I am well Ms. Kamala. Thanks for asking. Hope you are doing good too. You can use palak. Infact I used palak today! It comes out nice.